I knew how it was going to end before they even began. I wished for a moment the grown up in me, lurking somewhere, would step forward and declare the activity ill-timed. But the child in me wanted to aid their spontaneous creativity; even though the adult knew we’d be forced to clean up the debris all too soon. Sometimes I really can be the adult in the background; providing the afternoon tea with a smile, continuing with my laundry and house-work, whilst ensuring everyone is happy and playing fair. This wasn’t that kind of play-date. A mischievous part of me rebelled with glee and carefree abandonment of responsibility. The house was a mess. Dishes from lunch waited to be cleared, laundry festered in baskets, popcorn laid strewn across the carpet. I gaily offered up ice-cream and joined in with their game of stirring it into a creamy, tasty mess. I threw in 100’s & 1000’s for extra affect, drizzled chocolate sauce into the bowls and added slices of banana (darn it – there was a smidgen of the sensible adult in the background after all – adding in something healthy to counteract all the sugar). My eyes were drawn to the boggy mess of the garden and the leaf covered trampoline. The air outside the kitchen window was wintery cold, but I wanted to forget that for a moment and play like it was summer. ‘Come on!’ I said, with surprising energy (and a level of enthusiasm rarely exhibited without wine, chocolate or coffee). My just turned eight year old daughter and her friend smiled at me with mixed looks. I wasn’t sure if they thought my enthusiasm was ‘cool’, ‘strange’, ‘weird’ or ’embarrassing’. Nevertheless, they happily ran outside and were quickly swinging, bouncing and setting up obstacle courses on the muddy lawn. It was then that my daughter’s friend caught site of my children’s ‘artwork’ on the fence – left overs from a sunny day of carefree painting. 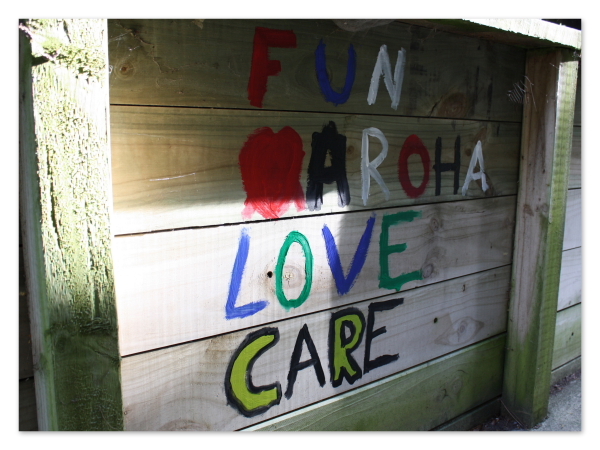 I’m sure most other parents would say ‘No!’ to painting on the garden fences – and a part of me wishes I had said that and left the fences looking ‘normal’, but the rebellious streak won out. I knew what was coming. I knew they’d want to paint. I also knew it was nearing 5 o’clock – the time which the play-date was supposed to be ending. It wasn’t summer. Darkness was creeping into the sky. It was getting cold. I should have said ‘No’. I didn’t. Paint pots and brushes were quickly found. I watched as hands were covered in green, black, white and yellow. They weren’t just painting, they were covering themselves in the stuff. Smearing their skin in various colours, covering all the pink and turning it into something alien looking. Painted handprints adorned yet more of my plain wooden fencing. It kind of worried me that my adult self wasn’t ‘doing something’, but I didn’t care. A bigger part of me liked it. A large bucket of warm, soapy water was my one responsible offering, as well as towels. My one year old daughter thought this was the best and climbed into the bucket to immerse herself in bubbles, before putting her arms up to be hoisted out so that she could cover herself in yet more paint. All her clothes came off. It was winter. What was I thinking?! But the smiles, the laughter and the spontaneous creativity won out. Sometimes it feels very, very good to just ‘do it’. For a moment I let the adult in me quieten and retreat. I couldn’t entirely let go and shake off the adult me, but I didn’t let it take away the fun either. Yes there was mess, there was lots of mess. But I don’t want to be forever me saying ‘No’ just because of mess. Those fifteen minutes of crazed fun with the paints were worth the mess. What made today mean something? Listening to the child in me and letting the child win a victory for spontaneous fun! 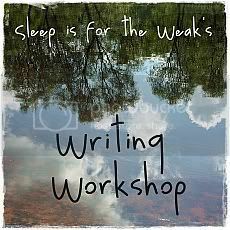 Joining in with Josie’s writing workshop at ‘Sleep is for the weak’ with this fortnight’s prompt, ‘What today meant?‘. Write about a moment, a thought, something you did, something that happened to you, something somebody said to you, that made you stop for a moment. It doesn’t have to big or impressive, just one thing that left you different because of it. Something that felt significant, beautiful, or that just made you feel something. It doesn’t have to have made you feel good, not all days bring us that, but it needs to have touched you. Try and capture it and pin it down with the words you use. 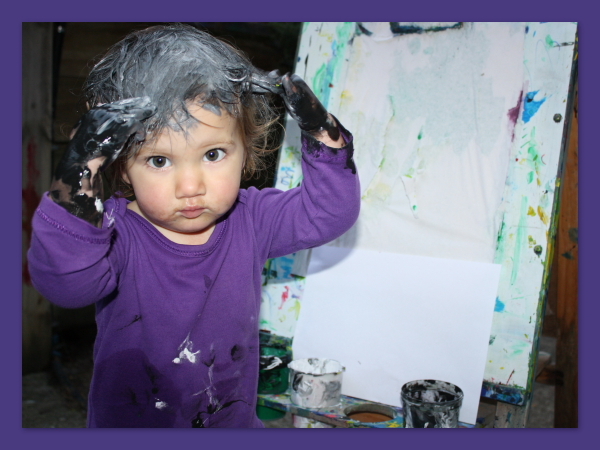 Alice, Art, Writing Art, children, messy play, Painting, sleep is for the weak, writer's workshop, writing. permalink.